In a similar fashion, Insights for ArcGIS represents not just an evolutionary step, but perhaps a revolutionary one. It empowers anyone to explore location-based data by applying interactive analysis to glean not only understanding, but insight. The proverbial aha! moment in true understanding. Jack Dangermond unveils Insights for ArcGIS at the opening plenary of the 2016 Esri Federal GIS Conference. 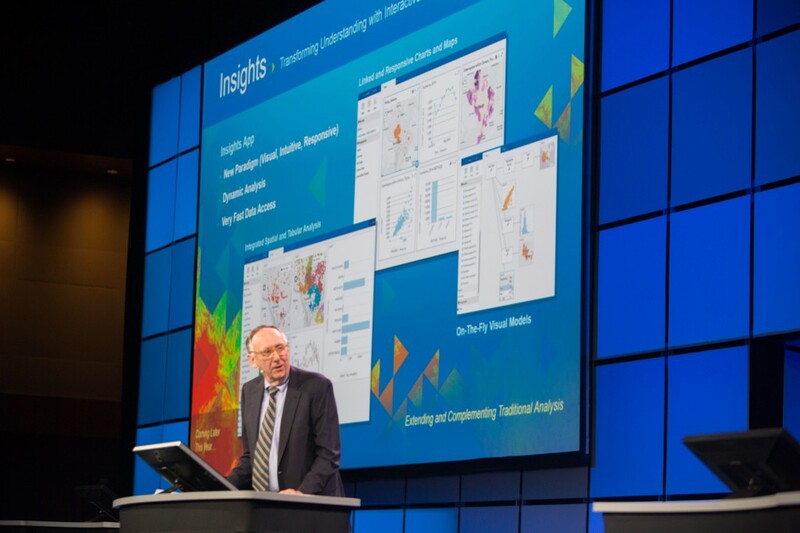 At the 2016 Esri Federal GIS Conference, Jack Dangermond unveiled Insights for ArcGIS. Insights is the newest addition to the ArcGIS Platform, and a new experience that enables interactive analysis with your data, no matter the source, in a geographic context. Enterprise data like that found in data warehouses and geodatabases, unfortunately, often sits in silos. It’s underutilized and very difficult to analyze all at once. These data often present challenges that may surface with respect to performance (queries taking too long), usability (complicated tools), or accessibility (disparate data sources). A unique aspect of Insights for ArcGIS is that it integrates enterprise data. From the back-end system to the user experience, Insights is designed to solve these problems and allow users to actualize the potential in their enterprise data. Insights also leverages Esri’s vast ecosystem of data, including the curated and authoritative Living Atlas of the World. By including a wider variety of information in analysis, users can now find answers to questions that they previously couldn’t even think to ask. To ensure fast performance and a low-latency user experience, Insights for ArcGIS selects the most optimal way to query and work with your data. For certain types of data, it executes queries at the source. This means that you don’t have to wait for new derivative data to be created with each query or analysis. With other data sources, like big data, it can leverage the existing power of your analytics engines. All of this is orchestrated by Insights behind the scenes. Insights for ArcGIS also introduces a new paradigm for data exploration that is visually-oriented, intuitive and responsive. Users can drag-and-drop fields to introduce new data into their analysis. Maps, charts and tables that represent data are housed in cards, which can be linked to each other. Any action in one card can be visually reflected in the others. For example, if a data point is clicked in a chart, it can filter and update the view in other cards. Since it is integrated with the ArcGIS platform, Insights provides many of the powerful analysis tools that users are familiar with (e.g., summarization, proximity, statistical and pattern analysis, and more). For visualization, users have access to thematic maps and the complete gamut of smart mapping capabilities. Insights will be released later this year. Early Adopter and Beta programs will begin in Q2 of this year. You can apply to participate in the Beta, and learn more about Insights today at www.esri.com/insights.